What is Healthcare Management in the Digital Age? What Is Healthcare Management, and How Can Technology Improve It? Online Degrees | Bachelor’s | Healthcare Management | What Is HM? As long as people become injured or ill, they’ll need caring, compassionate providers and caregivers who work in healthcare organizations. Those organizations require healthcare management professionals to direct their activities, to ensure continuous patient care improvement, and to select the right technology that will improve efficiency and patient health outcomes. The future of healthcare management involves continuously leaner systems and management teams. Gone are the days of top-heavy leadership reporting structures. Healthcare managers must manage more medical facilities, clinics, or hospital departments than they did in the past. These skilled individuals provide a variety of functions, including policy administration, accounting, facilities management, and overall operations. They are also often responsible for reviewing and advising on new technology. All of these roles are focused on the same thing: patient-centered healthcare. Healthcare management and healthcare administration aren’t quite the same; however, many people use the two terms interchangeably. Healthcare managers oversee day-to-day clinic, department, or facility operations. They supervise caregivers, providers, and staff and make sure the patients are satisfied with their healthcare experience. Healthcare administrators are the upper leadership team for the healthcare organization. They create strategic plans and ensure that the organization’s goals and budgets are met and that the organization is improving its healthcare service every year. People who wish to pursue these careers typically obtain a healthcare management degree. Many already have experience in healthcare as a provider or caregiver. People who pursue a degree in healthcare management need a strong background in life sciences and communication. 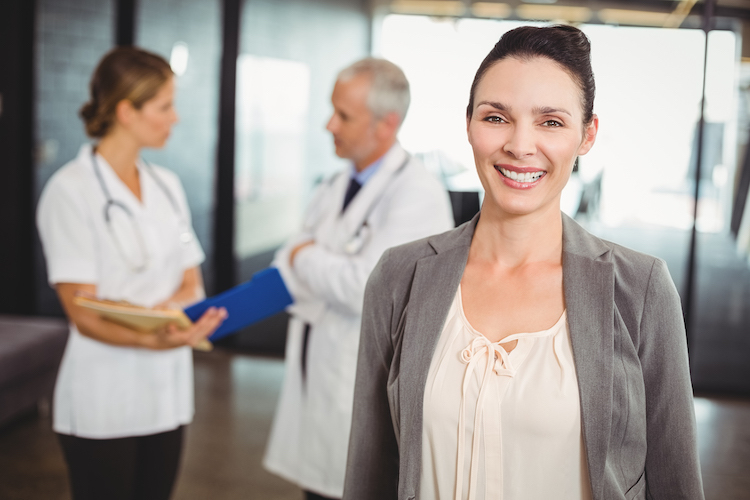 Positive interactions with patients, caregivers, and providers, as well as relationships with all healthcare team stakeholders, are essential to success as a healthcare management professional. Healthcare management degree holders can pursue positions as hospital administrators, private practice or urgent care managers, hospital CEOs, health information managers, home health agency managers, hospital department managers, and mental health service managers. The need for healthcare managers continues to grow as the healthcare industry expands to meet the needs of a population that is growing, aging, and increasing its overall longevity. Although interpersonal skills are at the core of great healthcare management, many wonder how technology can improve it. In short, what is healthcare management’s future? Technological innovations have improved the quality of patient care by giving patients’ broader access to their medical records; adapting medical care to patients’ schedules; developing safer medical procedures, tests, and studies; and using technology to gather patient data, analyze it, and apply it in new ways. Today’s approach to healthcare management needs to adapt its policies and procedures to take advantage of technology to improve patient outcomes and satisfaction. The use of technology is an essential part of the growth and change that is occurring in healthcare. As new technology becomes available, a healthcare management professional reviews the facility’s needs and implements the latest technology to increase efficiency and provide patients with improved care. Some of the most important technological advances on the horizon include wearable and implantable devices, telemedicine, data analytics, and artificial intelligence. Wearable and implantable medical devices are among the fastest-growing segment of the technology industry, with a 16% annual growth rate. These sensors are designed to collect and submit important patient data that can provide improved care. Data can be used in a variety of settings. For example, a device can alert emergency personnel when a patient falls. Wearables can monitor patients’ vital signs and activity levels, too. Some patients even log at-home physical therapy compliance via smart devices and apps, which can submit data to patients’ caregivers or providers. Implantable devices may be able to give doctors and care providers information about medical events and potential health emergencies. Wearable and implantable devices are already available but are expected to continue to evolve in the coming years. Devices will become smaller and be able to collect and transmit more information than ever before. These devices will improve the way healthcare is managed. Telemedicine uses real-time interactive communication between providers and patients. Patients have access to providers whenever and wherever patients prefer. This technology takes advantage of the internet, audio-visual connectivity, and encryption methods to ensure that patient-provider interactions remain private and secure. This cost-effective technology has led many employers to pursue telecommunication options, like telecommunication kiosks in the workplace, for their employees. Having this kind of healthcare access can potentially help to improve time on task and lower absenteeism, so businesses run more smoothly. This upgraded telemedicine technology provides patients with a private audiovisual portal. With the appropriate equipment and technology, telemedicine allows patients to record their vital signs so the provider can perform an online assessment and give the patient sound medical advice. Remote patient monitoring systems collect data from patients that can then be utilized to provide improved medical care. Information is reviewed and analyzed for each specific patient, and those findings are then instrumental in creating the patient’s continued care plan. Statistics such as physical activity, medication levels, blood pressure, heart rate, and other vital data can be gathered and compiled for easy online viewing by medical professionals. Remote monitoring will likely become even more important as a large segment of the population reaches old age, and it will be up to healthcare managers and administrators to build up the systems and data infrastructure required to support remote efforts. The ability to monitor patients on a remote basis will enable physicians to proactively treat potential medical problems to greatly enhance healthcare treatment options and improve quality of life. Data analytics will also need to be properly managed. Patients will have more information available than ever before, but it has to be adequately secured. Administrators must also utilize resources to ensure that patient data is used in accordance with HIPAA and other legal guidelines. Artificial intelligence (AI) in healthcare analyzes anonymous patient medical data and uses that data to suggest diagnoses and treatment plans for individual patients. Patients submit themselves to medical studies and tests; AI compares the patients’ results with the test results from the hundreds of thousands of patients’ results in its database to produce recommendations. This deep medical knowledge frees providers up to choose the correct diagnoses and create care plans to treat a disease and fit patients’ lifestyles and priorities. As artificial intelligence software improves, so too will medical organizations’ efficiency and patient outcomes. Healthcare management professionals play important roles in the implementation of new technology. They must weigh the cost of these innovations against the benefits that technology brings to patient care and operational gains. The combination of assessing these advancements, creating implementation plans, and ultimately drafting and putting into place the operational processes and training to go with the new technology is a specialty unto itself. Healthcare managers and organizational leadership establish strategic priorities and ensure that all of a healthcare organization’s efforts are directed at reaching yearly goals and improving patient care and satisfaction. Students pursue health sciences degrees because they want to improve people’s health on the individual level. But those who choose healthcare management degrees do so because they want to improve patient health for larger populations. Find out how a Bachelor of Science in Healthcare Management from Maryville University can bring you closer to the career you seek in healthcare management. Visit Maryville University’s Healthcare Management Program to learn more. Now that you have a better understanding of what healthcare management is, discover potential healthcare management careers.